If you want to get some serious sound quality from your iPod then look no further than the Bowers & Wilkins Zeppelin, an integrated iPod dock complete with digital amps and built-in speakers. The dock sits on a sturdy chrome outrigger that stands proud of a chrome bar and has a reassuringly sturdy feel when accessing the iPod's functions. Each side of the speaker holds a 25mm tweeter unit and a 90mm slotted woven fibreglass midrange cone and both of these are powered by their own 25-watt amplifier. 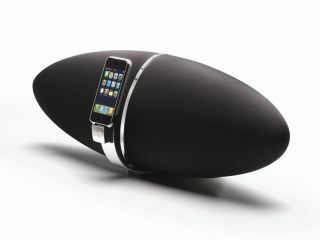 A 125mm bass driver, driven by its own 50-watt amp and matching, pebble-shaped piano gloss remote completes the package. There's even a composite and S-Video connector for playing iPod videos on your telly. TechRadar has teamed up with B&W to give one lucky entrant a chance to win this dream dock, along with a year's subscription to music download service Society of Sound. Nine runners up will also receive a year's subscription to Society of Sound. Every entrant will qualify for a no hassle three-month free trial to the service, for which they will receive a best-of sampler album of high-quality downloads, plus a single a month. Society of Sound offers specially recorded exclusive albums in super high-fidelity 24-bit, recorded at Peter Gabriel's Real World Studios. Bonus albums and back catalogue mean members pay less than £1.90 an album. Subscribers have the choice of three high-quality lossless music downloads - Apple Lossless, 16-bit FLAC and 24-bit FLAC. These incredibly high-quality music files get you closer than ever to the sound the artist created in the studio. For more information, check out www.bowers-wilkins.com/sos. This competition is now closed. The winner is Elaine Huxstep. The runners up are Karl Edlin, Matthew Hockney, Matthew Hayman, Sarah Hajdari,Dan McLachlan, Jane Adair, Emma Jones, Jen Rogers and Steve Pountney.